Cut rhubarb into 1/4-inch-thick cubes. Tear bread into 1/2-inch pieces. Spray a shallow 1-quart baking dish with PURE. In medium bowl, combine melted butter and bread pieces; cover bottom of dish with 1 to 1 1/2 cups bread pieces. In another bowl, combine rhubarb, apple, 1/2 cup brown sugar, cinnamon, nutmeg, and lemon juice. Grate zest; add to mixture. Let sit until juices begin to run, about 5 minutes. Spread half of rhubarb mixture over bread pieces. Sprinkle with 1 cup more bread pieces. Add remaining rhubarb mixture and juices; cover with remaining bread pieces. Sprinkle 1/4 cup brown sugar. Dot with 2 tablespoons butter slices. Cover; bake 25 to 35 minutes on the middle rack, until rhubarb is tender. 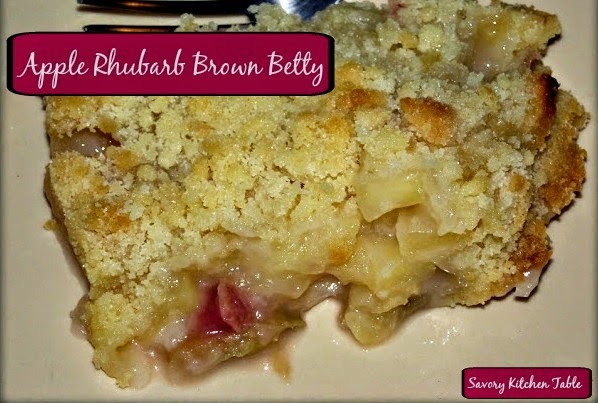 Increase heat to 400 degrees; uncover, and bake 10 to 15 minutes more, until rhubarb is soft, top is crusty, and juices begin to bubble at edges of baking dish.